3 Tips for Taking Care of Business so the Fun Can Start! 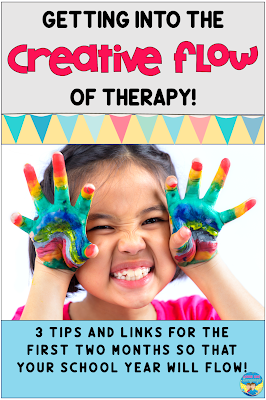 Despite some differences, there is a flow to therapy routines over the course of a school year that can help you prioritize how to spend your time each month and get that dratted paper work done to get you to the creative flow of therapy. For example, have you ever received a student from another school system with IEP goals that make you wonder? Why does he have this goal? How is working on this going to help him this year? Is this really what he needs in his current classroom placement? My middle schooler, "C," made me wonder these things, yet I had all of the monthly business to take care of, too. Click on any of the topics if you’d like to read more information on it. You will be taken to another blog post specifically for that topic. Every year, the first month is busy with organizing your materials and therapy space. If you’d like some tips (and horror stories) just click on the topics. Some school systems move SLPs around depending on caseload numbers, but almost every school has you packing up for cleaning over the summer. So each year, you get a chance to revamp your therapy space and get organized. In some schools, therapists have the same caseloads each year, with changes occurring when new students start at the school and others move on. Other schools, with multiple therapists, give out new caseloads every year. Either way, there are lots of IEP reviews and material purchases (or creation) going on to meet new IEP goals and student needs. Lots of paperwork! Updating student information, setting up log notes and data sheets, and of course, the dreaded scheduling! Don’t forget, you also need to set up your room behavioral expectations and make sure that the students you have grouped together fit in some way. Because of all this paperwork, and having new students and/or new IEP goals, having open ended activities around can be very useful at this time of year. Other life savers include books, crafts, comic strips, wordless videos, and computer activities. By now you have probably gone through multiple scheduling changes. If you don’t use post-its for scheduling yet, you should definitely give it a try. 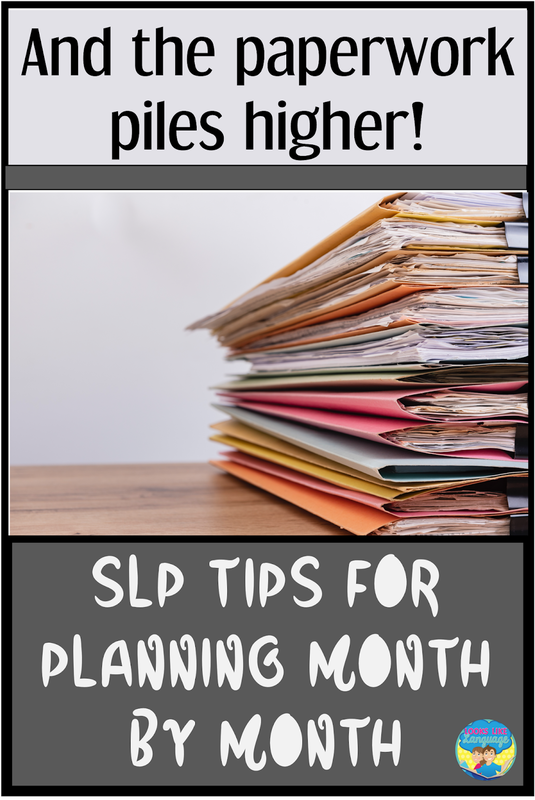 SLPs usually need to make schedule changes all year long for a variety of reasons: classroom schedule changes, students coming and going, and IEP related service changes being a few. Many schools have a back to school night sometime during the fall that SLPS are expected to attend. It is a good idea to think about these general topics ahead of time in case you get asked questions. • Do you give homework and how would you like parents to help? • Do you have a session make up policy in your school system? • How do you stay in touch with parents regarding student progress? • What are your room rules and incentives? 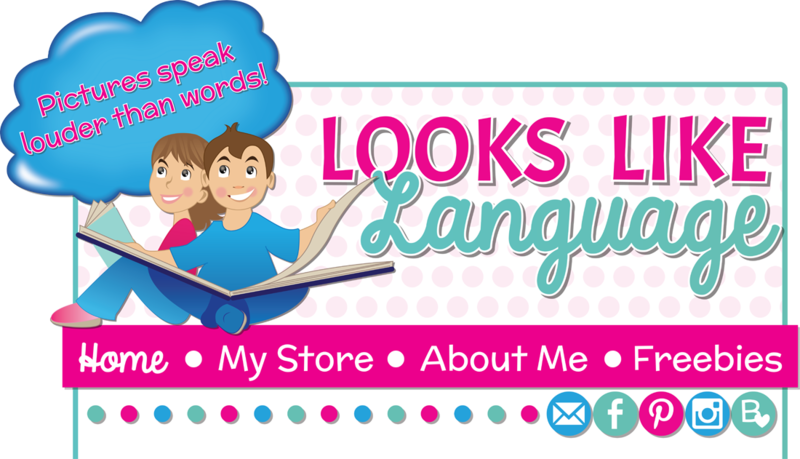 • Have a general discussion of what speech/language therapy involves ready to educate parents. You may be surprised how many really don’t know why their children are coming to you. Excellent free handouts can be found on TpT. • Have a statement ready to let parents know that this is not an individual conference, but that you will be happy to talk to them another time regarding their child’s specific needs. • Parents always love to see work their students have done. Make a bulletin board in your room for this! Now that you hopefully have some of the basics going steadily along during the school day, the second month is a good time to do some informal assessments to get a better idea of your students’ strengths and weaknesses, both in their IEP areas and general speech/language skills. • Making videos where they explain something they have completed, retell a story or give a narrative about an event. 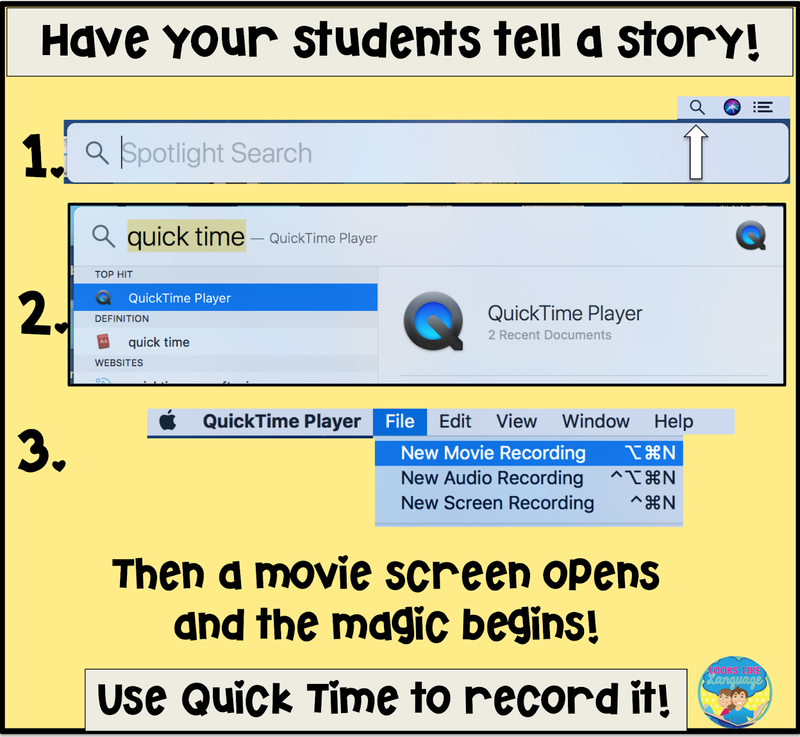 My verbal students loved recording themselves and knew more about using Quick Time than I did. If you haven’t used it yet, here are some links to get you started. You know all of those additional assignments that SLPs tend to get? It is true, they take us away from that endless pile of paperwork we have to complete, but they also provide an opportunity we might as well take advantage of since we are stuck. To me, the creative magic of therapy comes with a flow you get when students are really involved, interacting with each other, and getting a chance to improve skills that they really need. Not just what the IEP goal says. "What?" You might be asking yourself this. Speech/language test results and IEP goals are based on concrete, measurable skills, but life isn't concrete and measurable. Take "C," a sweet middle school boy who was floundering in a regular education class despite having a good auditory memory, great syntax and sentence structure, and comprehension of facts. He came to my caseload with a goal for following directions, but he could follow 4+ steps and most concepts. I felt the magic begin to happen when I started to figure out what he really needed. "How?" you might ask. "OLA!" I say! Observe. While you are walking to the photocopier, doing bus or lunch duty, or popping into the classroom, observe your students in their natural interactions of the school day. Listen to what your fellow educators have to say about this student, especially the classroom teacher. They don't look at the student's problems from the same perspective as we have, obviously, but teachers spend a lot of time with your student in a group setting and are your best resource for real life observations. Respect your teachers for the skills they have in managing groups and understanding the larger picture of how your student functions in that group, all while teaching a curriculum and managing their own paperwork. Your therapy will be much more on target! Act. When you co-ordinate the observations of your fellow educators regarding your student's needs, the observations you have made of how the student functions in the school environment, and your knowledge of communication needs, you can apply all of this information to how you address the IEP goals and the creative flow begins! You may not ever place a number value on it, or write it on a session note, but when you integrate the social, behavioral and communicative needs of your student into your therapy sessions, you will make noticeable changes that impact your student's whole school day. And my student, "C"? After doing this, I realized that his real problem was being too literal! He didn't follow classroom directions well if they were ambiguous or could be interpreted too literally. So, we worked on following directions by figuring out different meanings of words and sentences, then reasoning out which one the teacher actually meant. Success! So, don’t let the endless paperwork get you down! 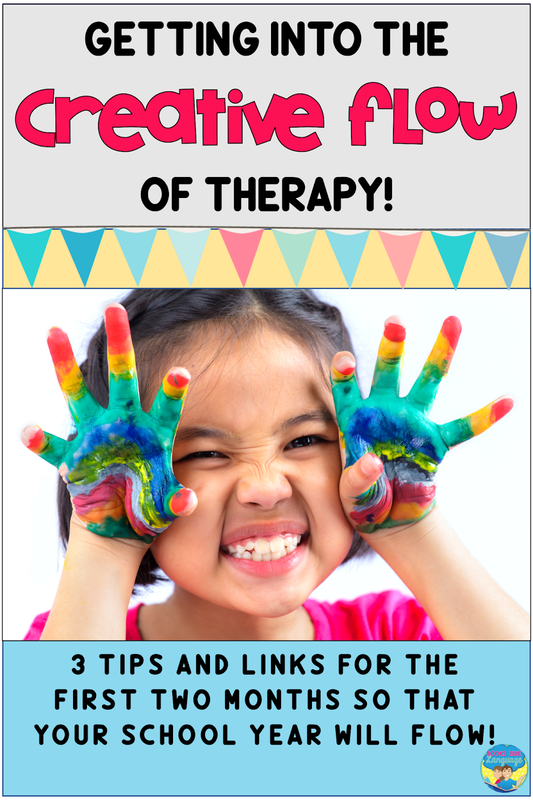 Once you have the basics outlined here under control, you can use your knowledge of your students’ needs to start getting creative in therapy! The next post will feature some creative ideas for Halloween! If you have a favorite creative idea of your own, get in touch! I'd love to feature photos of your creative fun on my Pinterest board SPEECH & SPED: Halloween. Just email me! Did you leave my last post about combining books with play thinking, “Those are great ideas, but how do I do that?” Then this post is for you! Step 1: Choose a theme! • Make groups work when you have to switch your groups around for make-up sessions. 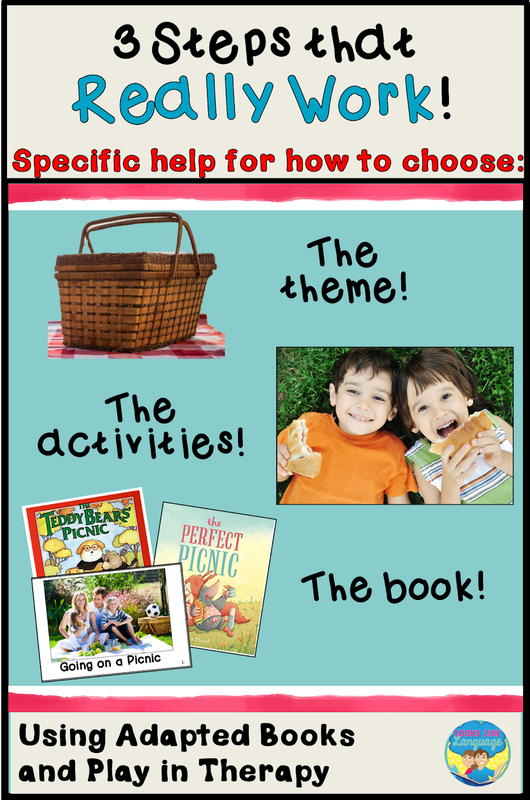 • Coordinate with the theme being used in a pre-K or K classroom. • Get out a limited set of toys, books and craft activities for the time you are using the theme. • Start collecting fun toys and activities to expand your theme for next year. Step 2: Choose and adapt a book! ⁃ Start by looking at what you already have around or can get inexpensively. Planning ahead and looking at the Scholastic Book club choices can be a good way to go, so parents can get the same book for home carryover! ⁃ Often it is good to have a higher level book and a lower level one for your theme, so you can meet most of the goals you are working on and have a cohesive set of follow-up activities for everyone. ⁃ Look at the pictures in the book. Does the text talk about what is happening in the picture or can you adapt the text easily so that they match? Our students need to have this visual matching support to make sense of the language in the text. ⁃ Adapt the book so that your lower level students can fill in the vocabulary words while your higher level students can complete the sentences. This can be done easily if you have more than one place with a blank Velcro spot to add the missing symbols. Just choose which set of symbols to remove depending on the needs of each student or group. Step 3: Choose your follow-up activities! 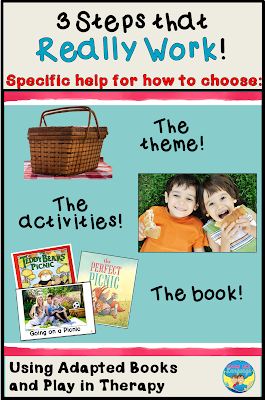 You want these activities to reinforce the language and concepts for the theme and the book. Best practice would have you read the entire book first before you focus on sections of it for skill building. - Start with the object vocabulary. Find toys or bring in the real items to elicit the labels. How about a picnic basket filled with the items you are talking about? Students can take turns putting their hand in the basket without peeking and pull out an item to label. - Re-enact the plot sequence by doing the activity. This is a great way to reinforce the object labels and introduce the verbs. If your students can handle it, go outside to an enclosed area and have a picnic with their favorite snack and drink. Do you have runners? Then have a picnic on your therapy room floor with the door closed. Still won’t work? Put a plastic tablecloth or red bulletin board paper over your table and have your picnic there while your student is in the accustomed seating. * Play having a picnic with toys. * Do a craft to make/decorate/color the vocabulary items. * Play a game with pictures of the activities involved in the theme. * Watch a You-tube video associated with the theme. * Use an interactive activity on your iPad for the theme. BOOM Cards are great for this! * Make flip book activity for forming sentences. * Adapt a picture worksheet to make an interactive activity, or have your higher level students just complete the worksheet. * Have students fill in more of the symbols in your adapted book, or use additional books to expand their language for the theme. 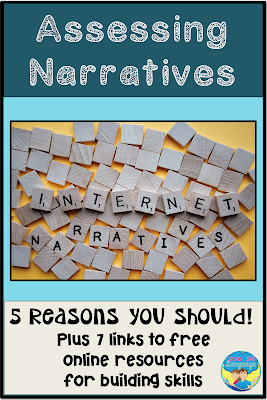 Checking students' narrative skills is on the top of my list for back to school assessments! Whether you do this orally or in a written format, there is so much information you can gain to help your students make progress over the year! Why do this routinely? Many speech/language skills are incorporated in narratives. information while staying on topic. 2. if there are word finding issues. 4. if there are grammatical errors. Being able to tell a narrative is necessary for school success. If your students are not able to relate familiar events in a sequential, understandable manner, how will they develop the discourse skills necessary for classroom discussions and written work? There are so many ways to get started, but here are a few of my favorites. Whichever method you choose to use, remember to save your students' first attempts so you can see their progress over the year. First, of course, check to make sure that our students can relate a personal experience. Why not do this using your computer? If your school uses Macs, this is quick and easy to do! Let your students think about what story they want to tell. The less input you give, the more natural their story will be. Then, open up QuickTime on your computer, following the steps in the photo. 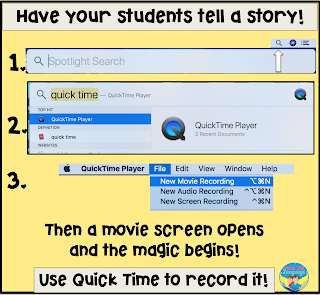 Your students can make a movie of their story and QuickTime lets you save it! What a fantastic pre/post assessment! Maybe your students need some guidance. What I did over my summer vacation is a school standard, but how about this idea that I found at Activity Tailor? Telling what you didn't do over the summer has a nice twist, keeping your students engaged and letting them be creative! You also will see right away if they understand negatives. 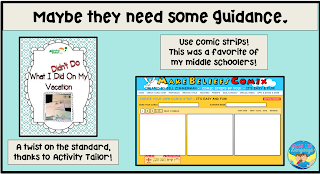 Maybe your students would like creating their own comic strips. 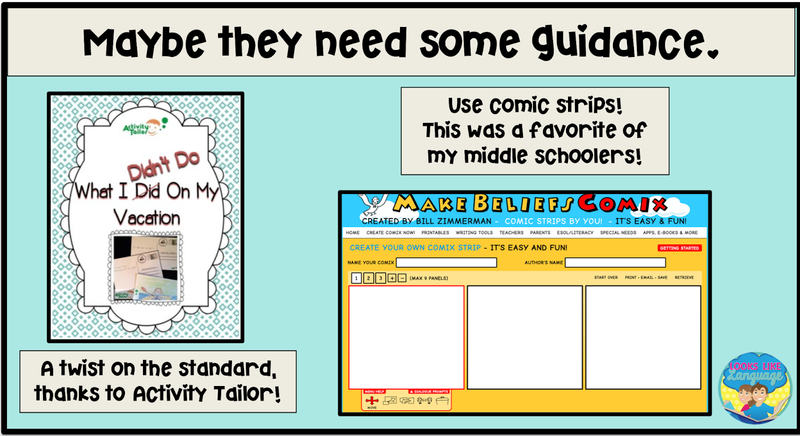 Mine loved Make BeliefsComix! You can save their creations on your computer, or even print their strip to let them write the narrative for it. Can your students create a story when given a topic? Teachers use story starters all the time, but I like using unusual photos. There are so many sites, just try searching words like ‘unusual’, ‘strange’ and ‘weird’ photos to find some that appeal to you. Book reports are a classic way that teachers use story retell. 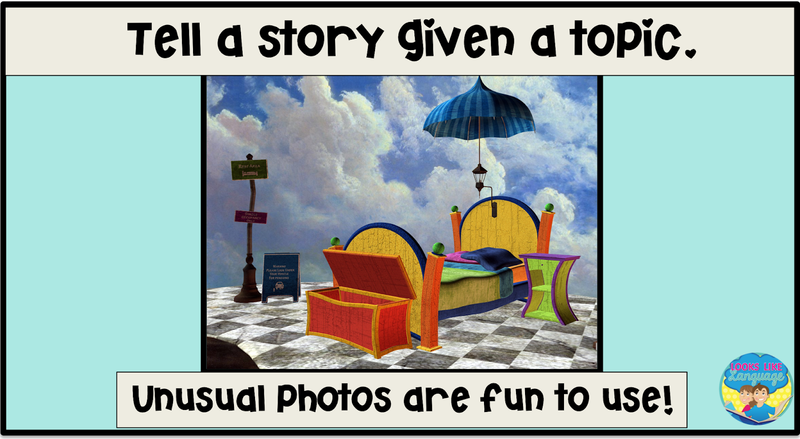 Help your students practice doing this with online sites that have quick stories to read and retell. Younger kids may like the ones here. And how about stories written by kids? 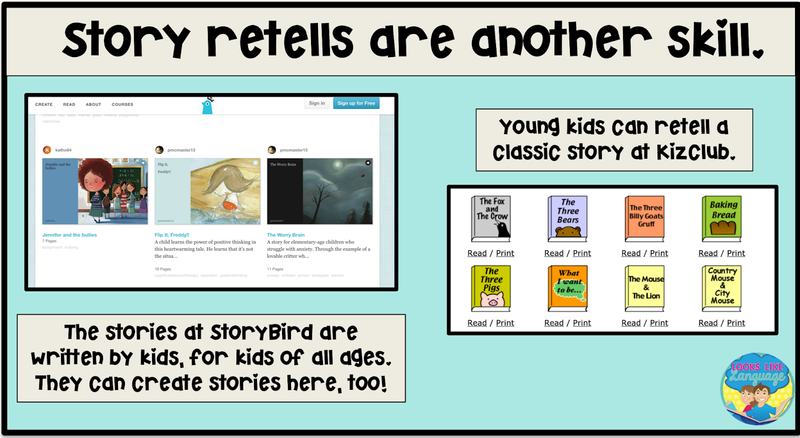 You will find many choices for all ages at StoryBird. Maybe you have some students in your group who have basic narrative skills. Don’t leave them out! There are ways to incorporate other speech/language goals into stories, too! 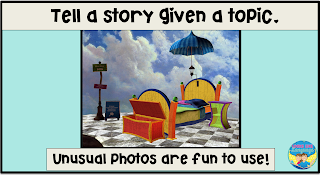 Build vocabulary and parts of speech using photos at PicLits. 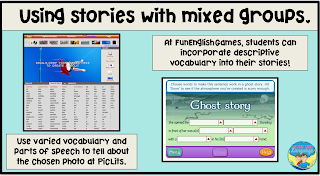 Work on descriptive skills with the stories at Fun English Games. Of course, you can find ways to work on carryover of articulation skills at these sites, too! Using online resources builds technology skills, too. Are books a vital part of your planning? I can't imagine doing without the physical format, personally, but teaching your students internet literacy is just as important. If you teach students from disadvantaged homes, they may not have the same level of access to computers, so they especially need it included in every aspect of school life to gain digital skills. 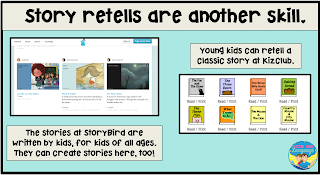 Using online books and stories also lets us see if our students engage with them before purchasing the book. YouTube is a wonderful resource for checking out books before you buy them. 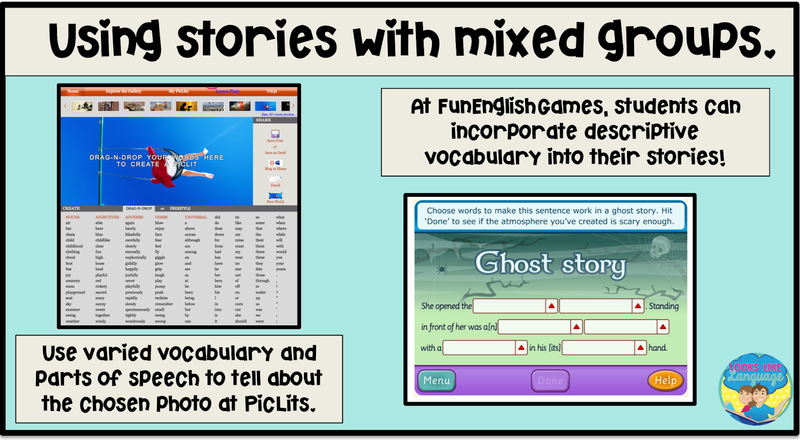 There are so many fun, free websites at all levels of skill that can help you improve your students' narrative skills with a little planning! Check out this post to get even more ideas. If you need to justify this use of your time to school administrators, check out the results of this study by Ron Owston et al. In their study called Computer game development as a literacy activity, they found that "Field notes and teacher interview data indicated that game development helped improve student content retention, ability to compare and contrast information presented, utilize more and different kinds of research materials including digital resources, editing skills, and develop an insight into questioning skills." What are your favorite resources for books and narrative skills?